There’s nothing quite as fun as watching Christopher Durang take on the Catholic Church, as he proved in his classic satire Sister Mary Ignatius Explains It All for You. But seeing him take on Anton Chekhov is also good for laughs. He does so in Vanya and Sonia and Masha and Spike, a 2013 Tony Award winner that borrows names and themes from the dour Russian, along with a general air of depressed malaise. That is, the characters suffer from depression; the audience is in hysterics. CATCO’s current production benefits from a director with a flair for comedy—David Hemsley Caldwell—and two lead players who are equally adept. Jonathan Putnam and Danielle Mann are quietly masterful as Vanya and Sonia, the 50-something siblings who share a miserable existence in the home once owned by their deceased parents. The first scene establishes their flinty relationship. Sonia brings Vanya his morning coffee, only to learn he’s already poured himself a cup. She complains that he’s deprived her of one of her few daily pleasures, leading to an argument that eventually ends in broken china. Sonia, we learn, was adopted. We also learn that she’s attracted to Vanya despite his protestations that he marches to a “different drummer”—i.e., he’s gay. Putnam and Mann inhabit the unhappy pair so thoroughly that their personalities come through even when they’re just sitting and glumly observing the world. Meanwhile, Chekhov is referenced in multiple ways, including Sonia’s insistence that a nearby stand of 10 or 11 trees constitutes a “cherry orchard.” But don’t worry if you’re rusty on the playwright’s works—Durang throws in enough explanations to keep everyone in the loop. In a nod to Greek mythology, he also makes sure we know why a character named Cassandra is doomed to making dire predictions that no one believes. Shanessa Sweeney is a live wire as the housekeeper, whose ability to see the future comes in handy following the sudden appearance of Sonia and Vania’s successful sister, Masha (Lori Cannon). The movie star barges in with her younger lover, Spike (William Darby), and begins talking about a change that will upset her siblings’ boring but stable existence. Narcissistic and overbearing, Masha proved a difficult character to enjoy at Wednesday’s preview matinee, especially since Cannon at first had trouble playing her with more than one note. Cannon fared better after intermission, when Masha’s insecurities bubbled to the surface and made her recognizably—and hilariously—human. Completing the near-perfect production, Eric Barker’s painterly set is expressively lit by Jarod Wilson to suggest the passage of time as the action wends its way from morning to night and back to morning. It’s an entertaining and surprisingly warm-hearted trip, and one that’s well worth taking. 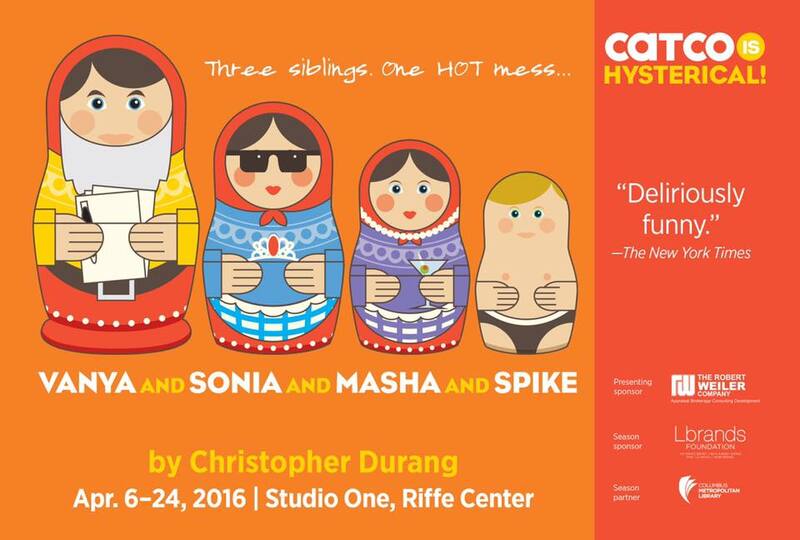 CATCO will present Vanya and Sonia and Masha and Spike through April 24 in Studio One, Riffe Center, 77 S. High St., Columbus. A preview will be presented at 7:30 p.m. Thursday (April 7). Regular show times are 11 a.m. Wednesday, 8 p.m. Thursday-Saturday and 2 p.m. Sunday. Running time: 2 hours, 35 minutes (including intermission). Tickets are $17 Wednesday, $30 Thursday, $40 Friday-Saturday and $35 Sunday. 614-469-0939 or catco.org.